The Lord works in mysterious ways. Or so the saying goes, but there is nothing mysterious about the incredible buzz which surrounds one of the most acclaimed acts around, Oh My God! It’s The Church. An international entertainment phenomenon, which combines live music, comedy and thrilling dance routines; their wild Services have travelled the world, infecting the masses with undiluted, raucous joy. 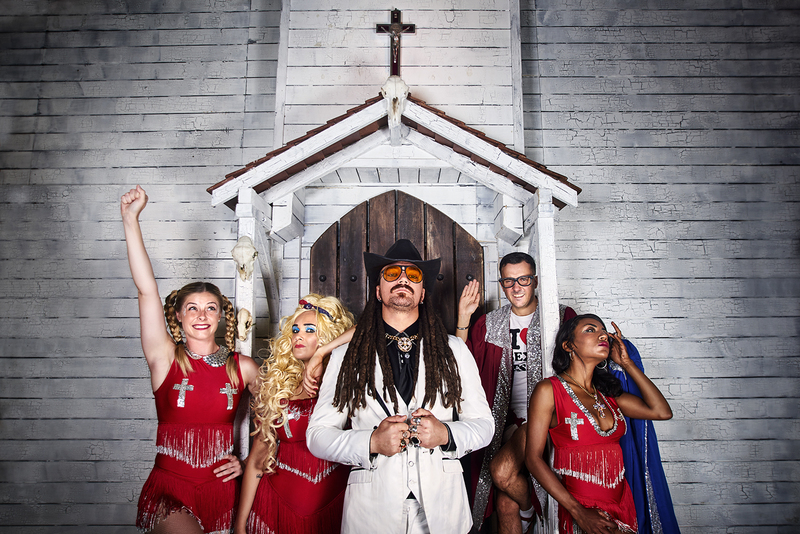 Fronted by insane preacher the Right Reverend Michael Alabama Jackson, their Mission from God is to bring people together through Funk, Soul, Disco and Absinthe… lots and lots of Absinthe. Oh My God! It’s The Church is like nothing you’ve ever experienced before and yet also as familiar as your Grandmammy’s biscuit tin. Nominated as ‘Live Act of The Year’ at the AIF Festival Congress Awards, this Leftfield Church service has their audiences rolling in the aisles and dancing on the pews! With Shotgun Weddings, Absinthe baptisms and hymns to set your Soul on fire, it truly is a Church service like no other. After a monumental 2018 which saw this all singing, all dancing, party church service traverse the globe, conducting services to a congregation of over 100,000 gleeful sinners, including festival Main Stage appearances at Bestival, Shambala, Wilderness and many more, Oh My God! It’s The Church are now preparing for their busiest and most high profile year to date. Oh my God! It’s The Church consists of 2005 State Preaching Champion- The Right Reverend Michael Alabama Jackson, three sexually adventurous choir girls- The Hail Marys, and one dim-witted organist – Morgan The Organ. Together they combine to create a fresh live act which has taken the UK by storm and is fast becoming the hottest ticket in town whether gracing the Main Stages at major music festivals, hosting one of their infamous underground club nights or thrilling revellers at the most exclusive parties on the planet.